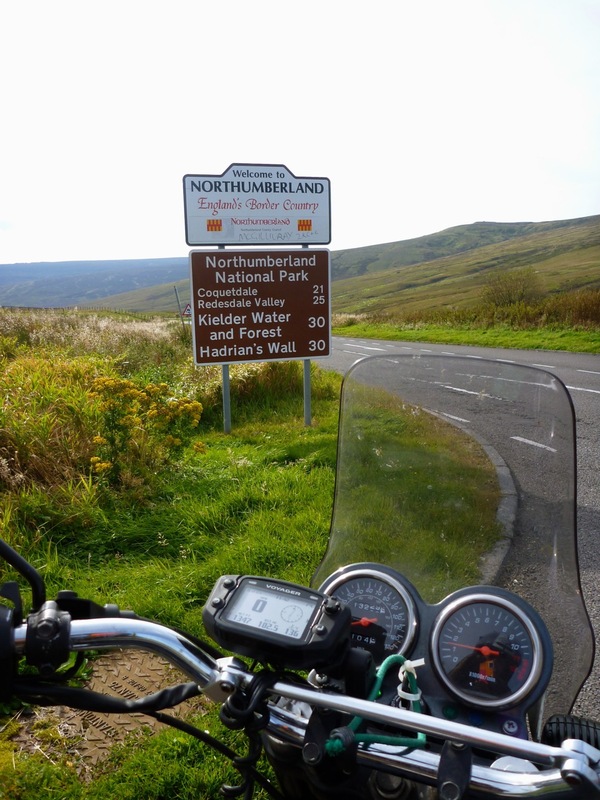 Since I rode the GS up to Scotland in June it’s received a few mods and the 700 mile ride back south (right) was a chance to put them to the test. Among other things I’d fitted K60 tyres on Tubliss liners with a splash of Slime. I made the back brake work, nearly finished my piperack, fitted flat track bars and an LED riding lamp. Setting off for the first 250-mile stage to a mate’s near Stirling west of Edinburgh was a sparkling day (left), but already there were warnings that an incoming storm would wipe any traces of late summer warmth off the face of Britain. Any chance of enjoying a slow ride home would be better compressed into the usual dash. A day after I got back it was another ‘month’s rain in a day’ story we’ve been hearing all summer. 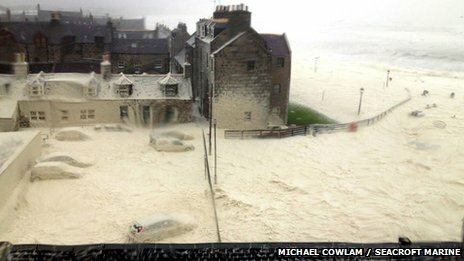 Roads I’d ridden hours earlier were closed by flooding or high winds, the trains stopped running to Edinburgh and a coastal town near Aberdeen got caked in wind-borne sea foam (above). Backing up, the ride over the Cairngorms proved I really should have remembered my Aero Kanetsu electric vest. Running it off the GS’s battery was one reason for fitting the SR-M LED lamp (to reduce the alternator load). Even in the sun the Trail Tech Voyager (to be reviewed) barely reached 9°C, so a hot soup in Aviemore spread a bit of warmth back into the limbs. Day two was going to have to be a 10-hour, 450-mile haul right through to London if I was to miss the much forecast gales. Even then, I could’t bare the thought of the dreary but functional M6 and M1 motorways, with the statutory pile-up/hold-up somewhere in the Northamptonshire area. 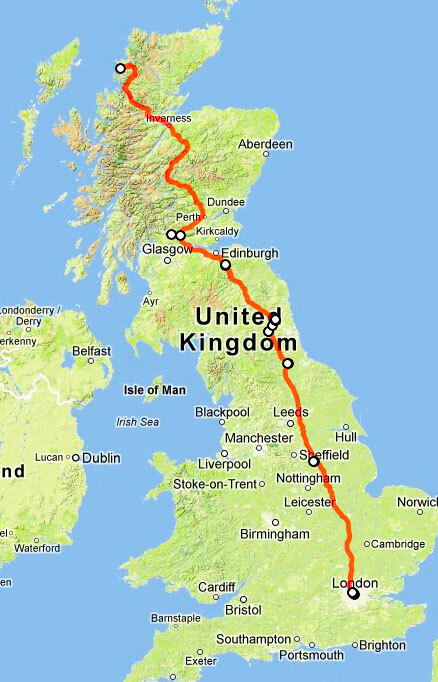 Instead, a more interesting line jumped off the map: A7 from Edinburgh to Galashields, hop over to the A68 which led over the border to Darlington, and from there slot onto the A1 to London. The variety made covering the necessary distance satisfying and I knew the run through Northumberland and County Durham would be fun. 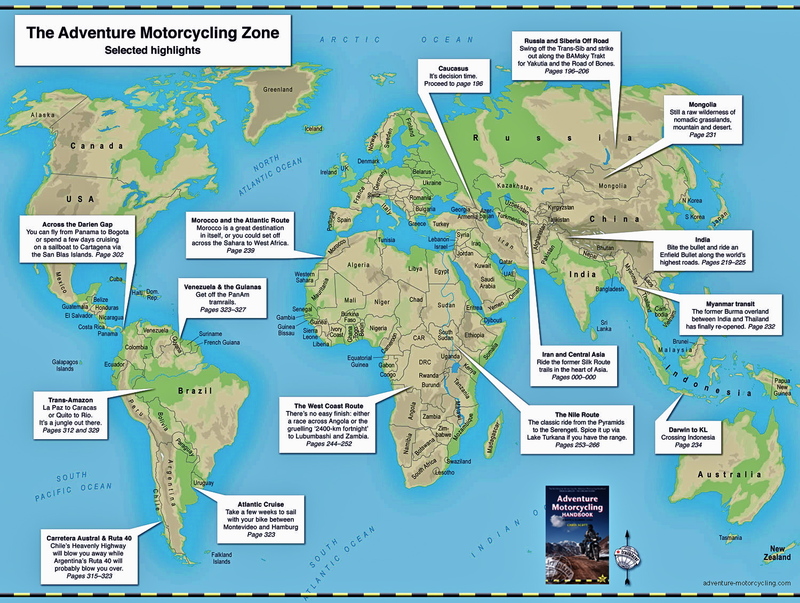 The miles piled on and the GS got notably smoother, as engines do. The lightly loaded Magadans sat behind me, tucked well in and attached or resting on the piperack, while the Voyager kept tabs on various aspects of my progress as I rode up some sweepers to the English border strung across the Cheviot Hills (right). It was a sunny Sunday and there seemed as many road bikes out as cars, but it has to be said cars do get in the way of enjoying a smooth ride, even on a GS500. I must have been stuck behind one of these or eyeing up the Voyager when the A68 took an sneaky right just before Otterburn while I blundered on along the A689 towards Newcastle. Didn’t want to go there so I turned right onto single track farming roads which I knew would lead to the A68 somehow. Without maps or a satnav, the Voyager’s compass proved a handy aid to negotiating the angular byways until I popped out back on track near Corbridge where the weekend throng were enjoying pub lunches. A fill up saw the mpg improve to 62mpg after yesterday’s all time low of 57 (conversion table here). I was due for a feed myself but wanted to catch up on my error and find an ambient eatery for a quick and casual refill. That turned out to be a Sunday bakery in a place called Tow Law near Consett. 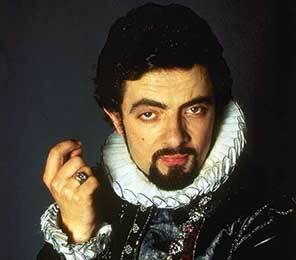 Consett I’d heard of – your man Edmund Blackadder (right) was born there, and in 1980 its steel mill – one of the oldest in the country – was not so much closed down as eradicated. The inevitable social consequences became a byword for post-industrial collapse. Sat at over 1000 feet in the east Pennines, nearby Tow Law was a smaller version of Consett, established after a Victorian era coal rush but now plateauing out following a steep decline at the end of the last century. 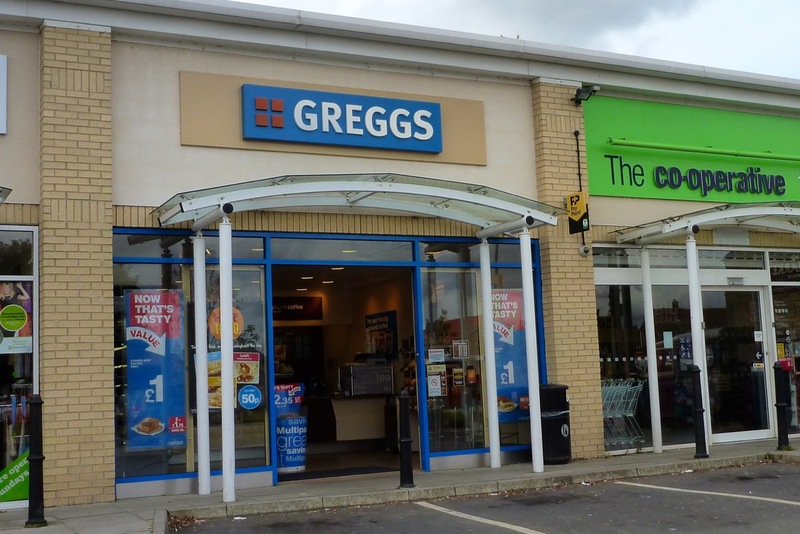 But it had a Greggs (left) – the first I’d seen in months, so Tow Law is alright by me. Two hot pies, a cream cake and a coffee. I was primed for the next 6 hours. Soon enough the A68 ran into the A1, the Great North Road built by the Romans. The better part of the day was over now, all that remained was to ride into the rain. That started somewhere in Lincolnshire, a light drizzle that the winds kicked up into a full-on lateral hosing. Like many bikers before and since, I sat on some Armco pulling my Rukka one-piece over my legs and wrapped the top half under the waxed Falstaff which was to be put to the test, along with the Magadans, the Rukka itself, the GS with it’s new K60 tyres and my X-Lite. I was also seeing how neoprene kayaking gloves worked as wet weather gloves (short answer: they don’t). What rider isn’t familiar with that trance of concentration that envelopes you when riding a busy road in the wet. The bike is humming as you try to maintain momentum while knowing it takes just one slow- or too fast reaction by you or others to become the unwelcome filling in a pile-up sandwich. Meanwhile your gear slowly begins to succumb or resist the 70-mph onslaught. If I was looking at myself behind the cosy flip-flap, flip-flap of some wiper blades I’d be thinking ‘cripes, rather you than me, mate’. The temperature dropped to 6 degrees, not a long way from snow, and the rain washed off the bugs but started running down the inside of the X-Lite’s visor, further reducing visibility while I bored through the spray. It was the autumnal equinox and luckily some sort of daylight shone through the murk. The thin neoprene gloves were proving to be a fast track to rheumatism, but the PVC Rukka lowers and even my old Altberg boots stayed immune. So too were the Magadans it turned out later. The insides got damp (they don’t claim to be waterproof) but barely a drop licked the outside of the thick inner bags. And the K60 tyres never missed a beat on the motorway or while cutting across Sunday night traffic through the middle of London. Although it was only a short ride, I got a bit more of a feel for using the Magadans. 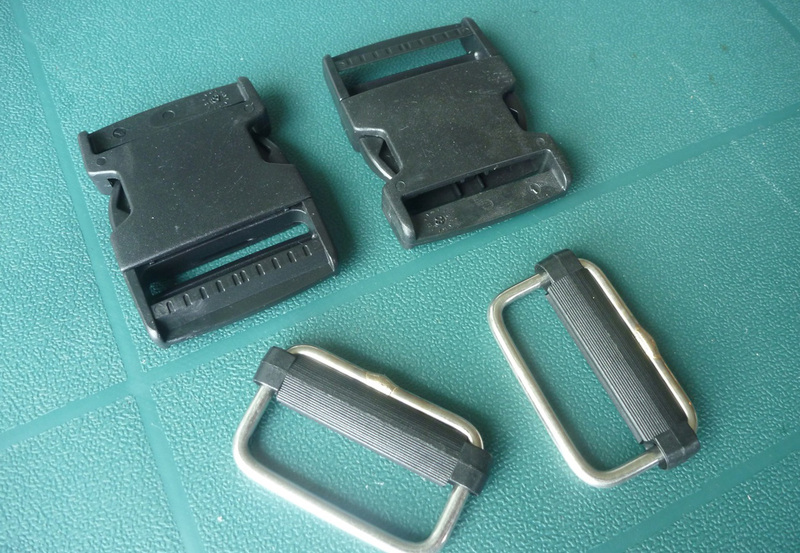 The buckle idea I mentioned is definitely the way to go to replace the over-seat velcro. As the bags sag or lift with different payloads you want to make small adjustments and doing that accurately with the double-sided velcro is a pain. With a ‘friction-bar’ buckle (right) a quick tug or release and you’re done. Opening the bags for access is of course easy but the inner bags are rather stiff when cold and so difficult to roll up and clip while complying with the outer form. But it was a cold day and anyway, the are scores of roll-top dry bags available, either full-size singles, or smaller multiples to help compartmentalise. 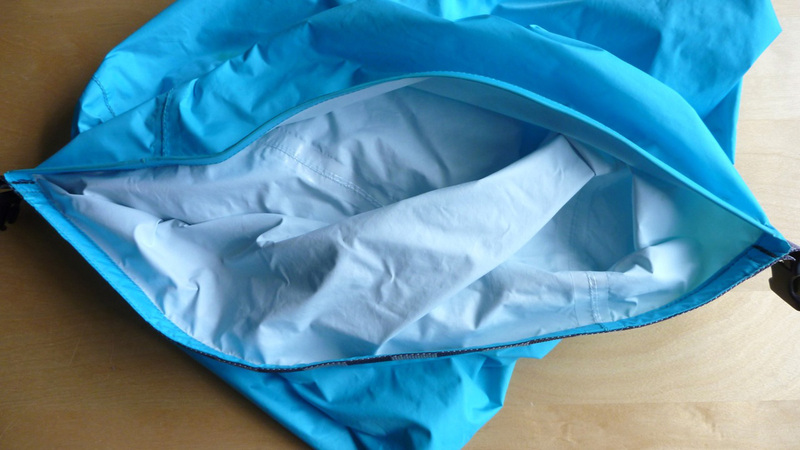 Though it’s much thinner coated taffeta nylon, Exped make a light blue XXL 40-litre rucksack liner dry bag (left) with taped seams and a white interior. 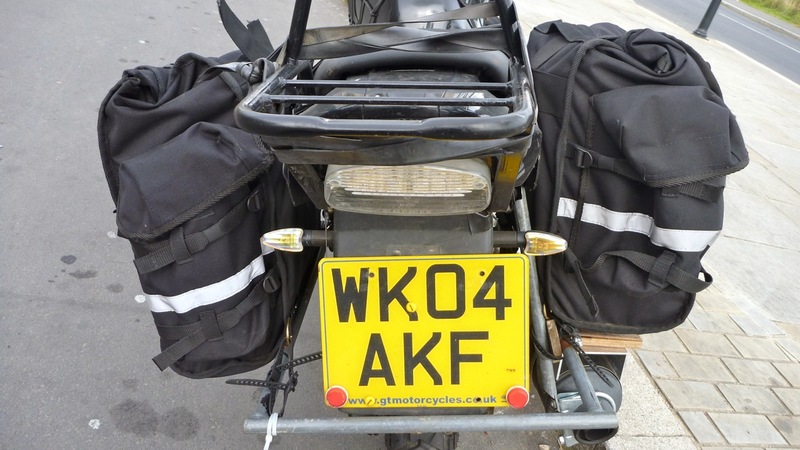 As with the Kriega Overlanders, a white or light colour would make digging around to find stuff a little easier. I lashed on my sewn on D-rings to the rack rather crudely and with numb hands had to yank them off when I got home. Once I have the rack finished I’ll be able to make some permanent attachment points on it and figure out a quick clip-on system, probably a smaller, one-inch version of the black clips pictured right. Not so amazing or surprising, was the Falstaff’s performance. 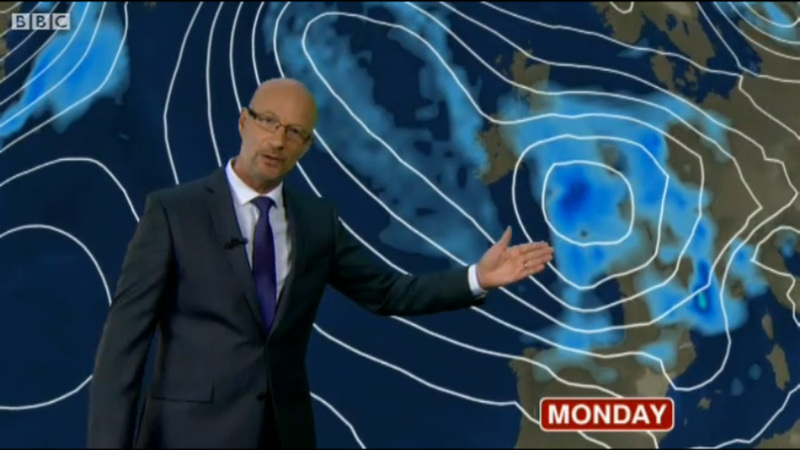 After an hour I could feel the wet against my arms just as I’d done in Spain months earlier, but more so. 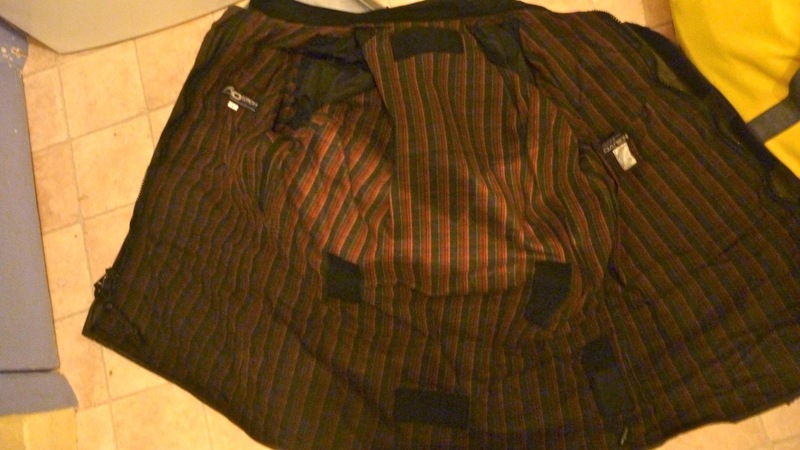 It was only when I got home that I saw the entire lining bar a small patch on the back (right) was soaked. My wallet and phone in the inside pocket were on the way to saturation. What a shame. Design and construction wise it’s a great bit of kit, but it doesn’t do what it needs to so I won’t be wearing that again. Still, now I know what works which so far still includes the Suzuki GS-R. I can’t say I notice any negative roadholding or handling issues from what might be seen as a thin rear tyre or indeed running identical tyres front and rear like an old Lambretta. Again I’m surprised how comfortable and endurable long days are on this bike, even in sub-optimal clothing. A big part of it must be the seat which engages well with the corresponding part of my anatomy, but I also wonder if it’s something to do with a modest engine and braking power which puts little stress on the body, while being enough not to feel vulnerable and under pressure in traffic. That was the reason for choosing and adapting an otherwise ordinary machine. 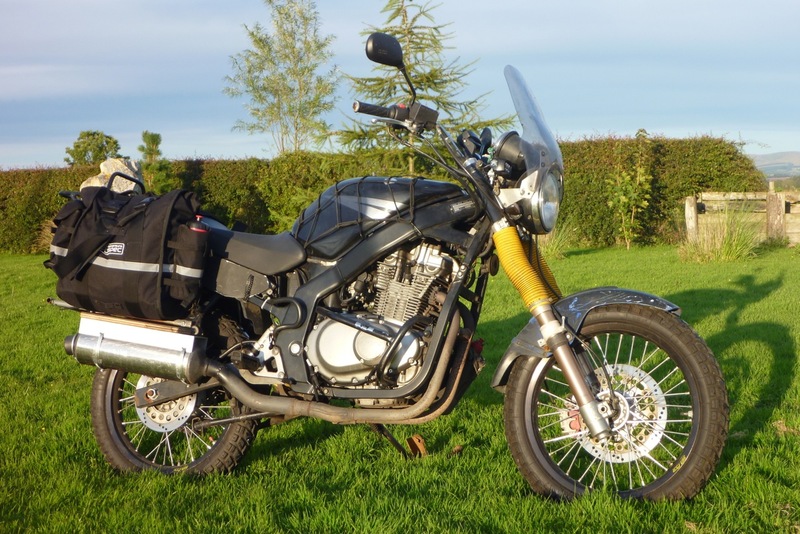 This entry was posted in Adventure Motorcycling Gear Reviews, AMH News, Project Bikes, Suzuki GS500R Overlander and tagged A68 road, Adventure Spec Magadan panniers, blackadder, greggs bakers, Heidenau K60 tyres, Suzuki GS500R overlander, tow law, Trail Tech Voyager. Bookmark the permalink.